Brussels is a European cosmopolitan city that constantly impresses everyone: it represents the capital of Europe. Brussels is home of the EU’s headquarters and also hosts the offices of many NGOs, think-tanks and international organisations. Not to mention that it hosts the most important global summits. People living in Brussels are surrounded by three official languages (French, Flemish and English) and they have a typical humour. It is well represented by the famous statue of a naked little boy who simply utilises the fountain’s basis as a toilet: yes I am referring to the famous Manneken Pis. And of course, Brussels has the best beer in the world which helps to survive the cold and grey weather. Brussels is that kind of city large enough for you hide to in incredible parks, cafés and that lets you travel easily and rapidly all around Europe. In September 2015 I decided to study in this enviable city to improve my university career as at Université libre de Bruxelles (UlB) in International Relations’ Master, specialising in security, peace and conflicts studies. What happened to such incredible city? On Friday’s morning I took a plane to come back to Milan, Italy, for the weekend. 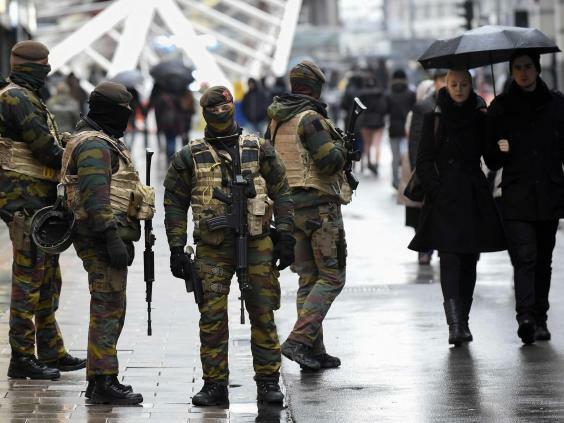 Belgian police was already looking for suspects connected to Paris’ terrorist attacks. The raids and arrests were held in Molebeek’s district which is well-known to be an unsecure zone, with highly tax of criminality, drug dealers and violence. I was somehow impressed to see those measures taking place by Belgian authorities in order to restore justice and security after the terrible terrorist attack of Daesh –better known as ISIS. On Saturday everything has changed: I woke up in the morning and couldn’t believe what Brussels had become in less than 24h: it was an escalation of security measures adopted by the government for the entire city: each subway system, soccer game, concert and general public event was shut down. Citizens were advised to avoid public places as commercial centres, museums, important squares, shops, cinemas, bars. Policies and soldiers started to patrol streets, airport and stations occupying every part of the city.I received an email by the University confirming the First Minister’s decision to close all schools and universities in Brussels, meaning that Belgian State could not ensure anyone’s security to attend lessons and the related activities. What impact did these decisions have on my life? My first reaction was astonishment: I was speechless because it never happened in my life to see an European city completely locked, empty and consequently to see all the people under the same feeling: fear. If government’s decision was to show a city completely paralyzed, well, they succeeded. Unfortunately, if government’s decision was to spread fear among citizens, they succeeded as well. For 4 days the level of alert was set at 4: the highest possible facing an imminent threat of terrorist attack. Why? National authorities – policemen, militaries, fire brigades – had to continue with raids because the fear of a terrorist attack like the one in Paris was terribly great. The State could not ensure security to citizens so that public places as schools, streets, bars, stadium, squares, public transportations were not accessible. “Laura you should not come back to Brussels: I have been staying home for some days because police told me I would not be safe otherwise. They told me to stay away from windows because the raids and possible gunshots would have kept on, no matter where and when” – my roommate back in Brussels texted me. Other two friends of mine from Italy remained at home for several days: seeing army forces in the streets, outside supermarkets, no way to access library or bars evoked in their mind one feeling: terror. What scared them most were military vehicles, heavily-armed soldiers and fire alarms that woke them around 5 am. Did being surrounded by military forces make their life safer? What’s the reason to remain in a ghost town? I checked news every hour and connected to Twitter trying to get more information regarding the situation, since all the news posted the same declaration of the Belgian Prime Minister “We still fear attacks here like those that occurred in Paris, involving several individuals striking simultaneously in several places”. So the capital was kept under the highest level of terror alert, due to an unspecified “serious and imminent threat”. Rather than providing specific information, police asked people not to report their movements on social media. 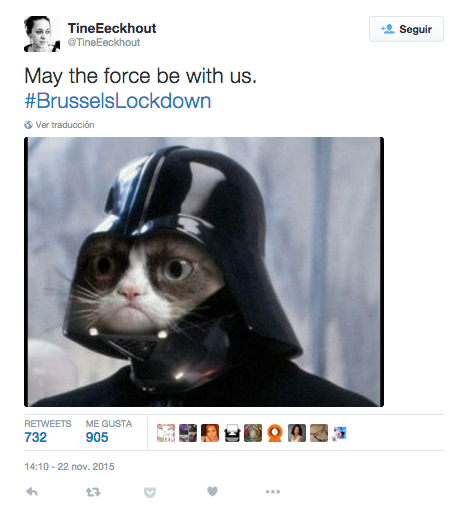 Not giving in to fear, Belgians on social media have responded with a defiant sense of whimsy: cat pictures, lots and lots of cat pictures. I personally feel deeply involved in past events for many reasons: Brussels, the city where I decided to currently live, is facing hard time of tension. I could perceive the effect of that tension on my friends and, even though most of them decided to stay there, they share alarming messages through social networks. They wanted to communicate reality and, in particular, the reality of their ordinary life during the 4 days of highest level of terrorist attacks’ alert. I will come back in Brussels in few days because I see it important to continue with my life and react to terror. Rather than being quiet, I chose to share my thoughts and feelings, and to express them; rather than criticising State’s decision, I chose to respect them, even though I do not to agree with all of them. “Scientia vincere tenebras” is the University’s motto which can be translated as “science defeats darkness”. I want to ask one last question: will scientia’s power effectively win darkness in the end? I hope that the concept of “scientia” – in a broader sense of human knowledge – is our best weapon against darkness of intolerance, violence and fear. It has to be a worldwide response to face any threat of terrorism therefore, to implement the best decisions to fight any threat of terrorism. At the end of this grey chapter, I hope to see courage over fear, intelligence over arms and solidarity over loneliness. See all the posts by Laura Crovetto at this link.